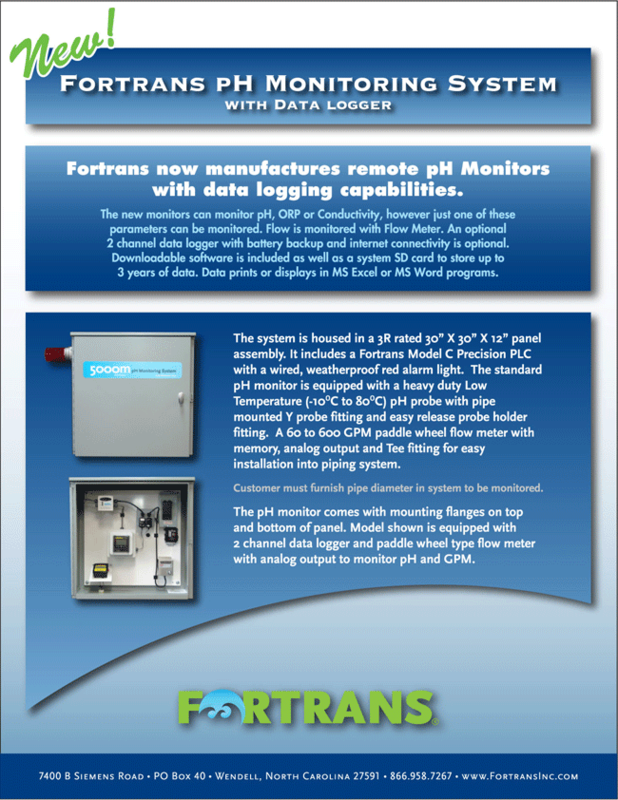 The Fortrans, Inc.® Model 5000M pH monitor and data logger system is a top-quality industrial process water pH monitoring system with built-in data logging capabilities. This pH monitor ensures that wastewater is being discharged under the legal limit for pH. The 5000M continually monitors the pH of wastewater as it is being discharged from your pH neutralization system, and when the pH exceeds the controller trip point, it automatically cuts off power to the wastewater discharge pump. Once the over-limit condition is corrected in the basin or tank being treated, the pump can then be restarted. The 5000M comes equipped with a 2-channel data logger that automatically stores the monitor’s data for pH and rate of discharge, and all data is stored on an SD card for use our data logging software on a PC or laptop. Once the history data is downloaded onto your computer, it can be viewed on MS Word or MS Excel programs. SD cards will typically allow for up to 3 years of data to be stored, but larger cards can be used for extended storage capacity. The Model 5000M pH monitor and data logger system includes a 1 horsepower, 115 volt submersible pump with temperature overload protection, a 50-foot power cord, and a 50-foot float switch to prevent run dry. With a 5-foot head, this pump will provide a 70 gallon-per-minute flow rate. The pump is connected to the pump switch, located on the exterior of the 5000M panel assembly. The factory-default trip point is set at a pH of 8.5, but customers may provide a custom trip point for factory programming. A low-temperature pH probe, operating from -10℃ to 140℃, is included with the 5000M, along with a pH probe fitting and a 2-inch Y fitting that must be installed in the customer’s 2-inch diameter schedule 80 PVC discharge pipe. The pH probe battery must be installed in the Y fitting, and the probe must be connected via BNC fittings for pH and temperature installed on the controller. The 5000M requires an electrical connection of 115 volts at 20 amps, connected to the load center in the control panel, and the pH probe’s battery must be inserted before the BHC connection through the fitting on the bottom of the panel.